I'm pretty sure that this is 7th South Staffs, as the C.O. in the centre of the middle row is Lt. Col. W.H. (Harry) Carter. As he joined the 7/SS in July 1917, you would assume this is 1917/18. The chap bottom left seems to have a haunted expression, but then again he has 3 wounds stripes. The chap top right has total confidence in himself, effortless superiority. Does anyone have any names to go with this photograph? It also looks as though the chap you mention has a dcm ribbon too. You noticed the guy on the right sitting on the horse ? over exposure ? I can't attach a close-up from a higher res photo as I'm near the 250k limit on this post. I will email it to you. I have the 7/SS War Diary so I'll look for a 2/Lt with a DCM (I think that's what his shoulder pips say, but you will know better than me). The guy on the right is there, not an illusion. He's looking through the trees at the picture being taken. From my copy, I think he has a tea-chest at his feet, and seems to be leaning against a building, and I may be over-imagining, but smoking a cigarette? Looks too me there are a few officers in this photo and do not know if giving you ranks will help locate names but its more information I guess to find other photo's. 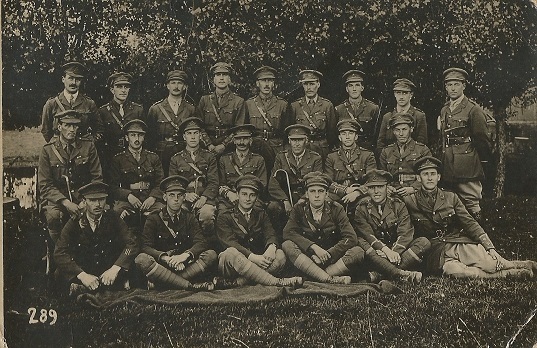 far right Lieutenant, Second from right 2nd Lieutenant (looks like pip on sleeve is in middle with non either side). Left Captain, 4th from left Lieutenant. One can certainly identify the positions held by some of the officers. The beribboned chap seated in the middle is the CO, with the 2ic on his left and adjutant on his right. The other seated officers are the four company commanders. The horsey looking chap standing on the extreme right is almost certainly the Transaport Officer. The Quartermaster is one of the two more elderly officers in the back row. 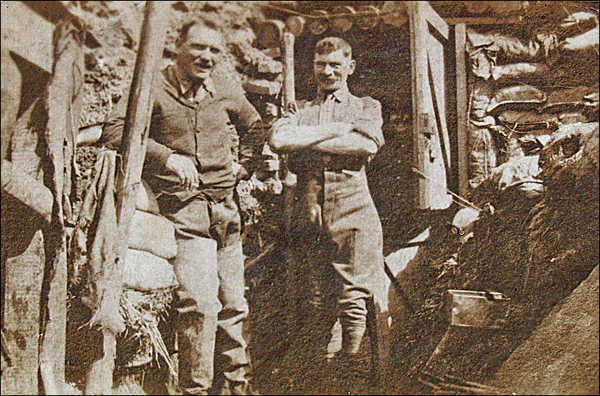 The war diary would produce the names of these officers, using the assumption that the photo was taken in summer 1918. PS The man with the three wound stripes on the extreme left of the front row has, from the expression on his face, seen too much war. Is it just me but do some of these seem not to have the same cap badge?? I have been perusing the History of the 7th South Staffs by Major Ashcroft, and it doesn't help too much. It all depends on the date of the picture of course. 2 i/c from Oct 1916 was Major A H Ashcroft who Charles suggests is on the C/Os left. The officer in the picture has ribbons, but Ashcroft only got his DSO in 1919 New Years list. Adjutant from Sept 1917 was Capt J A Baillon who got his MC in Oct 1918, Charles suggests that he would be on the CO's right but he has no ribbons. This is a bit confusing, could they actually be seated the opposite way round Charles? If the gent back right was the Transport Officer, I would expect an MC as T.O. from July 1917 was Capt C.N. Smith, MC in June 1917. The only officer I can find with a DCM was Lt & QM E Walker who got a DCM in June 1916 "performed the duties of QM for a considerable time" - doesn't quite square with his relative youth. Post war address Market Tavern, Walsall. All in all, I think I know more than when I started, but I still only positively know Lt Col Carter in the photo, and what a man he was! I have transcribed of List of 7/SS Officers from the history which I will add in case it is of use to anyone else in the future. Acton, Lieut. H. (8th S. Staff. Regt.). Joined " B " Coy., 4/5/18. A/Capt., Feb., 1919. Demobilised, Feb., 1919. Anderson, 2nd-Lieut. E. 0. (S. Staff. Regt.). Joined " D " Coy., 4/2/18. Address—Chancelot Terrace, Ferry Road, Edinburgh. Anderson, 2nd-Lieut. N. L. (7th S. Staff. Regt.). Joined in England, June, 1915, from 10th S. Staff. Regt. Wounded, Suvla Bay, 9/8/15. Rejoined, 12/11/15. To England (munitions), 4/12/15. Rejoined, 17/9/16. Wounded, Thiepval, 26/9/16. Address—c/o Braithwaite and Kirk, West Bromwich. 14/9/15 Transferred to 7th S. Staff. Regt. and appointed Lieut, and Adjutant, 22/9/15. Captain, March, 1916. Major and Second in command, Oct., 1916. June, 1916, Jan., 1917, Jan., 1919. Atkins, 2nd-Lieut. H. G. (4th S. Staff. Regt.). Joined, 7/10/16. Transferred to 32nd Infantry Brigade, 23/10/16. Bailey, Capt. C. V. (7th S. Staff. Regt.). Joined, England, 1914. Sick, Imbros, July, 1915. Rejoined, Arras, 31/7/16. 'O.C. " A " Coy., Arras. O.C. " C " Coy., Ancre. Acting 2nd in command, Somme. Baillon, Capt. J. A., M.C. (7th S. Staff. Regt.). Joined, England, Feb., 1915. To 10th S. Staff. Regt., June, 1915, Rejoined " A " Coy., Egypt, Feb., 1916. Lieut., Aug., 1916. Adjutant, Sept., 1917. Captain, Oct., 1917. Military Cross, Dec, 1918. Mentioned in despatches, June, 1918. Barber, 2nd-Lieut. (7th S. Staff. Regt.). Joined " C " Coy. Feb., 1919. 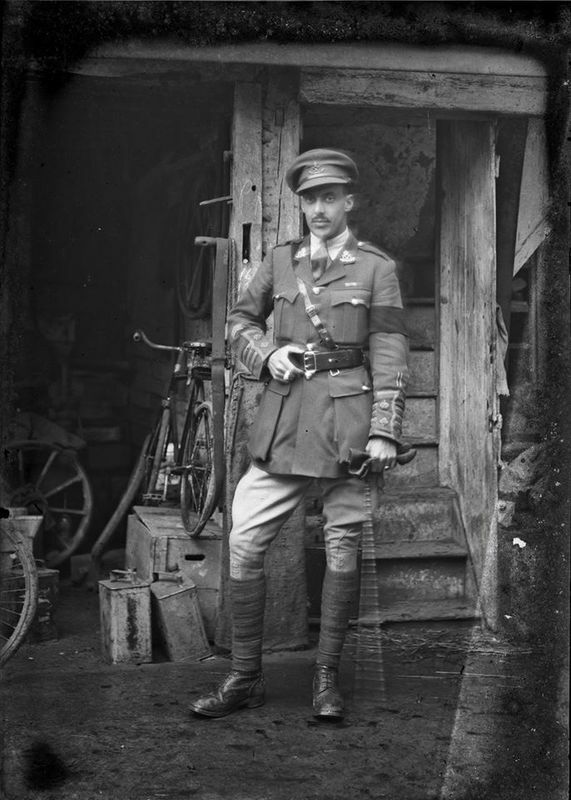 Baylis, 2nd-Lieut. F. S. (S. Staff. Regt.). Joined " A " Coy., 12/6/17. Wounded, Oct., 1918. Rejoined, Dec, 1918. Lieut., Nov., 1918. Address—The Leasowes, Burnt Green, Worcester. Beattie, 2nd-Lieut. S. M. (S. Staff. Regt.). Joined " A " Coy., 1/9/16. To England, sick, Sept., 1916. Bennett-Evans, Lieut. G. L. (7th S. Staff. Regt.). Joined, England, 1914. Rejoined, Imbros, Jan., 1916. T.O., May, 1916, to Sept., 1916. Wounded and remained at duty, Ancre, Nov. 1917. To England, sick, Feb., 1917. Bonner, 2nd-Lieut. E. A. (7th S. Staff. Regt.). Joined, Feb., 1915. To 10th S. Staff. 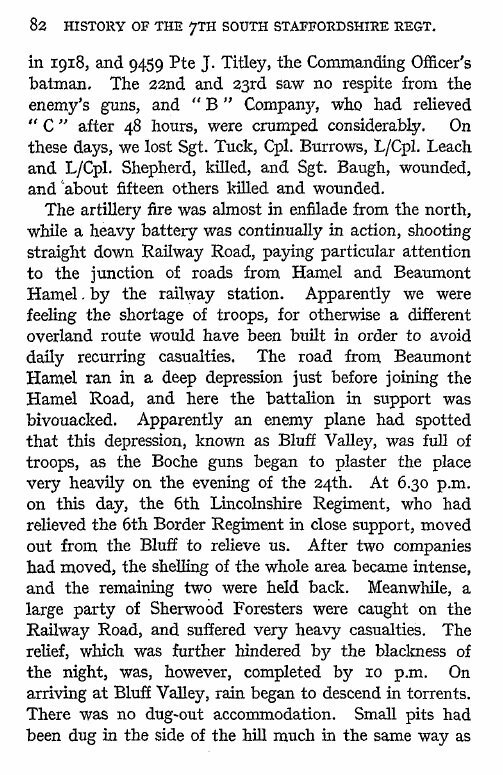 Regt., June, 1915. Rejoined, Oct., 1916. Bonner, 2nd-Lieut. G. (7th S. Staff. Regt.). Joined, Jan., 1915. To Anti-Aircraft Section, R.F.A., June, 1915. Bourne, 2nd-Lieut. A. S. (10th S. Staff. Regt.). Joined " A " Coy., Nov., 1915. Bombing officer, 29/10/15. To Gas School, off strength, 18/7/16. Wounded, 26/9/16. Bridges, Major E. C. P., D.S.O. (S. Staff. Regt.). Took over command of battalion, 11/8/15. "Wounded, 21/8/1915. Bruce, Lieut.-Col. G. T. (1/1 Glamorgan Yeomanry). 6th Lincoln Regt., Oct., 1917. Joined " C " Coy., Oct., 1915. Hospital, sick, 21/10/15. England, 22/11/15. Burnett, Capt. E. P. S, (S. Staff. Regt.). Joined Nov. 1916. A/Capt. 20/7/17. To Tank Corps, Nov., 1917. Burnett, Major J. S. (11h S. Staff. Regt.). Joined, 11/10/16.Attached 6th Lincoln Regt., Nov., 1916. Burrell, 2nd-Lieut. H. E. (10th S. Staff. Regt.).
" C " Coy., Oct. 1915. Appointed T.O., 17/2/16. Hospital, 27/8/16. Address—402, Camden Road, London, N.
Bussey, 2nd-Lieut. J, (7th S. Staff. Regt.). Joined, Aug., 1916. " C “ Coy. Killed, 29/10/16. (near Thiepval). Joined, May, 1917. Wounded, June, 1917. Cannell, Capt. F. S. (6th Lincoln Regt.). Attached for duty, 9/9/15. Attachment ceased, 25/9/15. Carr, Major R., M.C. (Border Regt.). Joined, March, 1918. 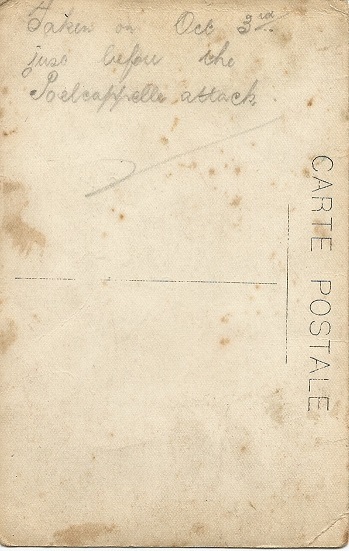 To 2nd Duke of Wellingtons, July, 1918. Carruthers, 2nd-Lieut. W. A. (11th Royal Scots). Joined " D " Coy., 16/3/16. To details, 24/6/16. Carter, 2nd-Lieut. H. W. (3rd S. Staff. Regt.). Joined " A " Coy., 11/7/17. To England, sick, Sept., 1917. 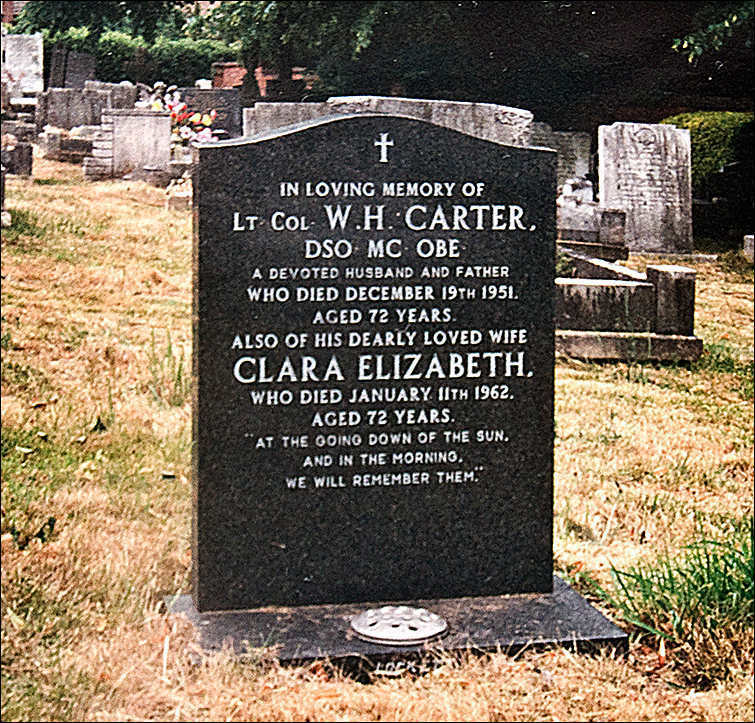 Carter, Lieut.-Col. W. H., D.S.O., M.C. (R. Warwick Regt.). To command, 7th S. Staff. Regt., 21/7/17. Bar to D.S.O., 13/12/18. Mentioned in despatches, 24/4/18. Brevet Majority, 6/6/18. Address—Maxwell Road, Vicarage Road, Wolverhampton. Catterall, 2nd-Lieut. E. C. (10th S. Staff. Regt.). Joined " B " Coy., 16/10/15. Signalling officer. Sick, 16/12/15. Chaplin, Capt. L., Nonconformist Chaplain. Joined, Oct., 1917. To England, March, 1918. Chapman, 2nd-Lieut. S. G. Unattached.
" C" Coy., 5/10/15. Hospital, 10/12/15. Rejoined, 19/2/16. Intelligence officer, 23/7/16 to 15/8/16. Wounded, 27/9/16. Charlton, Capt. R., M.C. (7th S. Staff. Regt.). 24/3/17 to 4/10/17. M.C., Aug., 1917. Killed in action, Poelcappelle, 4/10/17. Charrington, Capt. C. E. W., M.C. (4th S. Staff. Regt.). Joined " C " Coy., 24/12/18. Demobilised, Feb., 1919. Chatwin, 2nd-Lieut. H. (S. Staff. Regt.). Address—" Elmsdale," Wellington Road, Bilston. Christian, Capt. E. C. (7th S. Staff. Regt.). Joined, Nov., 1914. Wounded, Aug., 1915. Rejoined " D " Coy., 29/2/16. O.C. " D " Coy., 9/4/16. Intelligence officer, 17/8/16. Killed in trenches, south of Thiepval, 11/9/16. Clark, Capt. E. J. (R.A.M.C., attached 7th S. Staff. Regt.). Wounded, Oct., 1918. Awarded M.C., 5/11/17. Cleobury, 2nd-Lieut. S. (S. Staff. Regt.). Joined, 19/12/16. Transferred to R.F.C., 18/5/17. Cliff, 2nd-Lieut. R. A. (S. Staff. Regt.). Joined " D " Coy., 8/8/16. Wounded,.,,27/9/16. Address—12, Welbeck Road, Higher Broughton, Manchester. Coke, 2nd-Lieut. W. R. (S. Staff. Regt.). Joined " B " Coy., 16/1/18. To T.M. Bty., Feb., 1918. Address—439, Brixton Road, Brixton, London, S.W. Joined, Nov., 1916. To base hospital for duty, May, 1917. Cotterill, 2nd-Lieut. J. (5th S. Staff. Regt.). Joined " B " Coy., 20/10/16. England, substitution, June, 1918. Address— East View, Sutton Road, Walsall. Cox, Lieut. E. S. (1st S. Staff. Regt.). Joined, 22/11/16. To England, substitution, Feb., 1918. Address—Avon Llwydd House, Pontnewynydd, Mon. Joined " B " Coy., 9/5/17. Killed in action, Messines, June, 1917. Cowap, Capt. W. T. (7th S. Staff. Regt.). Joined, 20/5/16. O.C. " D " Coy. Wounded, Gallipoli, 8/8/15. Sick, to England,18/9/16. Off strength, 14/12/16. Address—37, Beechcroft Road, Beaconsfield, Plymouth. Crick, Capt. L. C. (6th Lincoln Regt.). O.C. " C " Coy. Joined, 23/9/15. To Lincoln Regt., 23/11/15. Joined " D " Coy., Dec, 1917. To 1st S.Staff. 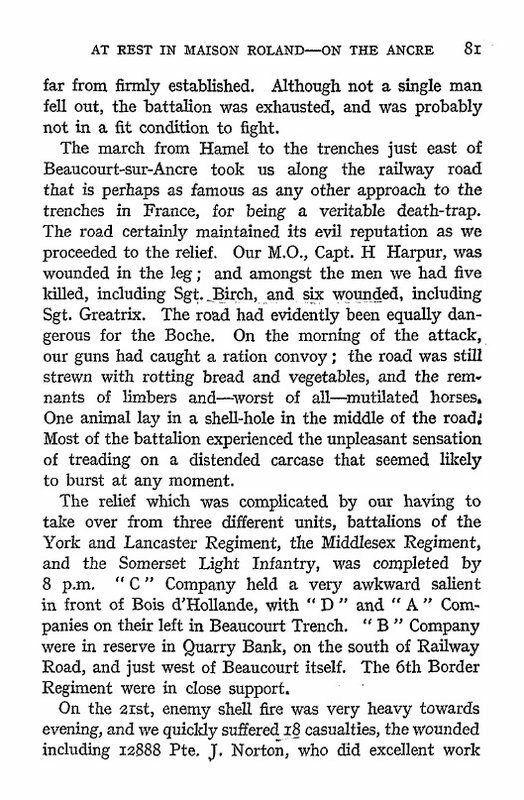 Regt., Jan., 1918. Dargan, Capt. P. R.C. Chaplain. Daukes, Lieut.-Col. A. H. (1st S. Staff. Regt.). Commanded, Sept., 1914, to Aug., 1915. Killed in action, 9/8/15. Joined, 6/10/15. Range finder, 14/11/15 to 24/11/15. Scout officer, 16/2/16. 33rd Brigade Intelligence officer, 20/7/16. To R.F.C., 3/3/16. Address—14, Albert Road, Regent's Park, London, N.W. Deans, Major G. N. (S. Staff. Regt.). Joined, Sept., 1914. O.C. " D " Coy. till June, 1915. Transferred A.S.C. M.T. Address—12, Rotherwick Road, Golder's Green. Dixon, Lieut. A. (7th S. Stafi. Regt.). Joined " B " Coy., 6/8/17. Transferred, 33rd T.M.B., June, 1918. Rejoined unit, Feb.
1919. Address—88, Traffic Street, Derby. Dixon, Lieut. A. M. (3rd S. Staff. Regt.). Joined " A " Coy., 1/8/18. Demobilised, Jan., 1919. Donnellan, 2nd-Lieut. T. (S. Staff. Regt.). Joined " D " Coy., 6/10/15. Hospital, sick, 27/5/16. Rejoined, 29/8/16. To E. Yorks., Jan., 1917. 11th Division, as Salvage Officer, 19/2/17. Donnelley, 2nd-Lieut. J. L. (10th S, Staff. Regt.). Joined " A " Coy., 8/12/15. Sick, 23/12/15. Downing, 2nd-Lieut. J. F. (7th S. Staff. Regt.). Joined, 5/10/15. 4/12/16. Address—Bushcroft, Tetenhall, near Wolverhampton. Dryden, 2nd-Lieut. W. B. (1st S. Staff. Regt.). Joined, 14/4/16 Mentioned in despatches, 24/5/17. Transferred from " A " Coy. to " B " Coy., 21/7/16. Lieut., 1/7/17. To Salvage Coy. Duck, Capt. F. P. (Lincoln Regt.). In command of composite battalion of Staffords and Sherwood Foresters, Aug., 1915, to Sept,, 1915. Duddell, 2nd-Lieut. A. L. (3rd S. Staff. Regt.). Joined, 31/7/16. Loaned to 32nd Brigade, 23/10/16. To R.F.C., 1/3/17. Dumbleton, 2nd-Lieut. J. E. (11th S. Staff. Regt.). Joined, 11/10/16. Loaned to 32nd Brigade, 23/10/16. To R.F.C., 1/3/17. Joined " C " Coy., 16/3/16 To Base Commandant, 19/6/16. Eccles, 2nd-Lieut E. J. (5th R. Fusiliers). Joined " B " Coy., 16/3/16. To Details, 20/6/16. Edge, 2nd-Lieut. F. S. (S. Staff. Regt.). Joined " D " Coy., 1/9/18. Demobilised, Jan., 1919. Evans, 2nd-Lieut. N. (8th S. Staff. Regt.). Joined, 4/4/18. To R.A.F., June, 1918. Evans, 2nd-Lieut. W. F. (S. Staff. Regt.). Joined " D " Coy., 19/7/17. Wounded, Aug., 1917, Ypres. Flinn, Lieut. E. C. (6th Lincoln Regt.). Joined, 7/2/15. O,C. " D " Coy. till 5/10/15. To hospital, 29/10/15. England, 1/10/16. Florey, Capt. B. W. P. (1st S. Staff. Regt.). Joined, Dec, 1914. " A " Coy. Wounded, 9/1/1915. Rejoined, Sept., 1917, O.C. " A " Coy. Ford, 2nd-Lieut. H. W. (7th S. Staff. Regt.). Joined " B " Coy., 2/11/17. Brigade Intelligence officer, 14/S/18. Address—47, Borthwick Road, Stratford, London. Forrest, Capt. H., M.C. (7th S. Staff. Regt.). Joined " C " Coy., 25/4/17. To Capt., 3/7/17. M.C., 9/12/18. Demobilised, Jan., 1919. Freeman, Capt. F. L. (S. Staff. Regt.). Joined " C" Coy., 12/1/16. Battalion Intelligence officer. Mentioned in despatches, 1/1/18. To VIII Corps, staff duty, 21/7/18. Freeman, Capt. J. F. F. (S. Staff. Regt.). Joined " B " Coy., 10/1/15. Adjutant, Div. School, 19/7/16. Lieut., 12/9/16. Rejoined, 14/5/17. Capt., O.C. " D " Coy., May, 1918. Wounded, Thiepval, Oct., 1916, and Messines, June, 1917. Goldfinch, Lieut. T. M. (2/1 Staff. Yeomanry). Joined " A " Coy., 5/12/77. Demobilised, Feb., 1919. Address—12, Albion Terrace, South Road, Faversham. Grant, 2nd-Lieut. B. C. (S. Staff. Regt.). Joined " C " Coy., 4/2/18. To 68th R.E. Coy., March, 1918. Gassed, May, 1918. Address—Ashbrook, 15, Bryngwyn Road, Newport, Mon. Grice-Hutchinson, Capt. C. (10th S. Staff. Regt.). Joined, 5/10/15. O.C. " B " Coy. Mentioned in despatches, 24/5/17. Address—The Grange, Hanley Swan, Worcester. Gwynne-Vaughan, 2nd-Lieut. K. D. (16th R. Fusiliers). Joined " A " Coy., 12/1/16. Transferred, M.G. Battalion, 4/3/16. Hall, 2nd-Lieut. E. G. (S. Staff. Regt.). Joined " C " Coy., 4/9/18. Wounded, Nov., 1918. Rejoined, Dec, 1918. Hanmer, 2nd-Lieut. H. I. (S. Staff. Regt.). Joined, 17/10/15. Transferred to R.F.C., 2/6/16. Harding, 2nd-Lieut. G. A. (S. Staff. Regt.). Joined " C " Coy., 4/2/18. Demobilised, Feb., 1919. Harland, Capt. C. C, M.C. (S. Staff. Regt.). Joined, 26/12/16. Adjutant, 26/12/16. M.C., 4/1/18. To Staff Capt., 85th Brigade, 17/3/18. Joined, Oct., 1916. Wounded, Nov., 1916. Harrison, 2nd-Lieut. F. F. (S. Staff. Regt.). Joined " B " Coy., 4/9/18.Wounded, Oct., 1918. Hartshorne, 2nd-Lieut. N. H. (11th S. Staff. Regt.). Joined, 6/10/15. 63rd Div. Gas Instructor, 6/8/16. Higgs, Lieut. R. D., M.C. (S. Staff. Regt.). Joined, 19/4/17. Lient., 1/7/17. M.C., 9/12/18. Demobilised, Feb., 1919. Address—The Willows, Brierley Hill, Staffs. Hodgson, Major C. F. F. (1st S. Staff. Regt.). Joined, 3/12/17. Left, 1/1/18. Div. A.P.M., Sept., 1918. Address—C/0 Messrs. Cox & Co.
Hollingsworth, 2nd-Lieut. F. (3rd S. Staff. Regt.). Joined, 1/9/16. Loaned 32nd Brigade, 23/9/16. Holloway, 2nd-Lieut. C. E. (S. Staff. Regt.). Joined, 6/8/17. Lieut. Nov., 1918. Wounded, Oct., 1918. Sick to England. Address—6, New Buildings, Wood Green, Wednesbury. Hoyle, 2nd-Lieut. H. (7th S. Staff. Regt.). Joined, 8/8/16. Sick, 31/12/17. Lieut., Mar., 1918. Awarded M.C., 5/11/17. Humphrey, 2nd-Lieut. E. G. (3rd S. Staff. Regt.). Joined " C " Coy., 31/7/16. To R.F.C., Jan., 1917. Hunter, 2nd-Lieut. M. A. C. (4th H.L.I.). Joined, 14/9/15. M.G. officer. Wounded, 14/11/15. Died of wounds, 15/11/15. Hutchinson, Capt. C, M.C. (1st Lincoln Regt.). Joined, 2/12/15. Attached Brigade H.Q., 11/2/16 to 1/3/16. Rejoined 6th Lincolns as Adjutant, 9/4/16. Hutchinson, Lieut. C. D. (S. Staff. Regt.). Joined " B " Coy., 5/10/15. Temp. Capt., 5/10/15 till 12/11/15. while O.C. " D " Coy. Attached Battalion H.Q., 11/3/16. To R.F.C., 19/6/16. lnstone, 2nd-Lieut. E. L. (S. Staff. Regt.). Joined " D " Coy., 11/7/17. Taken prisoner, 21/7/17. Joined, Nov., 1914. " D " Coy. Appointed Battalion M.G. officer. Jepson, 2nd-Lieut. B. (S. Staff. Regt.). Joined " A " Coy., 16/1/18. Jervis, Lieut. F. W. S. (S. Staff. Regt.). Joined " D " Coy., 8/12/15. To England, 4/1/16. Rejoined, 8/2/16, Off strength, 29/5/16. Joels, 2nd-Lieut. W. A. (10th E. Surrey Regt.). Joined, 8/5/16. " B " Coy. To details, 20/6/16. Address—36, Tyrell Road, E. Dulwich. Johnson, 2nd-Lieut H. V. (3rd S. Staff. Regt.). Joined, 19/12/16-" C " Coy. To E. Yorks., 19/2/17. Jones, Capt. R. V. (S. Staff. Regt.). Joined " C " Coy., 6/8/17. Brigade T.O., 13/11/17. Mentioned in Despatches, 1919. Kay, 2nd-Lieut. H. (N. Staff. Regt.). Joined " C " Coy., 8/12/15. To 33rd M.G. Coy., 1/4/16. Kite, Lieut. R. (S. Staff. Regt.). Joined " C " Coy., 25/11/18. Address—Hilton Lodge, Union Road, Lincoln. Laver, Lieut. F. R. (4th S. Staff. Regt.). Joined, 7/10/16. Loaned to 32nd Brigade, 23/10/16. Laughton, 2nd-Lieut. P, S, (N. Staff. Regt.). Joined, 4/12/16. To R.F.C., Feb., 1917. Address—35, Claudesdale Road, Upper Tooting. Joined, Nov., 1915. " C " Coy. Wounded, Aug., 1915. Lawrence, Lieut. G. F. (S. Staff. Regt.). June to Aug., 1915. Rejoined, Aug., 1915. To England, sick, Aug., 1915. Legge, Capt. the Hon. G. (7th S. Staff. Regt.). Joined, Sept., 1914. O.C. " D " Coy., 9/8/15. Lewis, 2nd-Lieut. W. E. (S. Staffi. Regt.). Joined " B " Coy., 13/6/17. Wounded, Sept., 1917. Address—211, Somerville Road, Small Heath. Lindner, Capt. F. J. D. (7th S. Staff. Regt.). Joined, Nov., 1914. " D " Coy. Wounded, 21/8/15. Rejoined, 29/2/16. To hospital, 4/3/16. Sick. Rejoined, 25/5/16. O.C. " A " Coy., 3/7/16. To base for duty; Feb., 1918. Address—35, Rock Park, Rock Ferry, Cheshire. Lloyd, 2nd-Lieut. B. (10th S. Staff. Regt.). Joined, Oct., 1915. Sick, Oct., 1915. McGevor,Lieut, and Q.M.J. (7th S. Staff. Regt.). Joined, Aug., 1914. To England, sick, 3/11/15. Marson, Lieut. A. E. (11th S. Staff. Regt.). Joined, 6/10/15. Wounded, 10/12/15. To England, 24/1/16. Rejoined, 11/12/17. Address—31, Station Road, Winchmore Hill, London, N.
Marshall, 2nd-Lieut. C. (3rd S. Staff Regt.). Joined, 31/12/16. " C " Coy. Killed, July, 1917. Ypres. Martin, Capt. H. C. (1st S. Staff. Regt.). Joined, Sept., 1914. " A " Coy. Killed in action, 9/8/15. Martin, Lieut. J. T. (2/1 Fife and Fife). Joined " A " Coy., 5/12/17. Wounded, March, 1918. Joined, July, 1918. " C" Coy. Awarded M.C. prior to joining. Masson, Lieut. H. R. S. (S. Staff. Regt.). Joined, 5/10/15. " D " Coy. Battalion bombing officer, 16/12/16. To Base, sick, Nov., 1917. Address—9, Rodenhurst Road, Clapham Park, S.W. Joined, Aug., 1915. Wounded, Aug., 1915. Joined, Nov., 1914. " B " Coy. Morris, Capt. C. M. (1st S. Staff. Regt.). Joined, Sept., 1914. Adjutant. Killed in action, 9/8/15. Joined, April, 1917. " B " Coy. To 22nd Corps, Feb., 1918. Mentioned in despatches, Jan., 1919. Address—15, Fitzgeorge Avenue, Kensington, W.
Montgomery, 2nd-Lieut. C. W. (4th S. Staff. Regt.). Joined, 7/10/16. " D " Coy. To England, Oct., 1917. Muirhead, 2nd-Lieut. L. R. (5th R. Fusiliers). Joined, 16/3/16. To details, 20/6/16. Muscat, Major C. A., M.C. (K.O.M.R.). Joined " B " Coy., 24/9/15. To hospital, sick, 9/10/15. Rejoined, 6/12/15. A/Capt., 28/9/16. A/Major, 1/7/18. M.C., Thiepval, 1916. Nicholls, 2nd-Lieut. S. C. (S. Staff. Regt.). Joined " D " Coy., 23/11/18. Address—"The Cottage," Church Lane, Oxley, Wolverhampton. Page, 2nd-Lieut. C. L. (S. Staff. Regt.). Joined " B " Coy., 18/7/17. Gassed, July, 1917. Ypres. Palmer, 2nd-Lieut. L. W. (S. Staff. Regt.). Parke, Lieut. A. (9th Lanc. Fusiliers). Joined " A " Coy., 16/3/16. Returned to 9th Lanc. Fusiliers, 7/4/16. Parkhouse, Lieut. R. (S. Staff. Regt.). Joined " C " Coy., 23/11/18. Attached Construction Camp, Dec., 1918. Piggins, 2nd-Lieut. H., M.C. (S. Staff. Regt.). Joined "C" Coy., 16/1/18. Awarded M.C., 19/3/18. Bar to M.C., 9/4/18. Pritchard, Lieut. E.W. L. (S. Staff. Regt.). Address—Les Vaux, Saint Saviours, Jersey. 12/10/17. To M.G. Corps, May, 1918. Pugh, 2nd-Lieut. A. E. (S. Staff. Regt.). Joined, 23/11/18. Demobilised, Jan., 1919. Randle, 2nd-Lieut. W. W. (7th S. Staff. Regt.). Joined " C " Coy., 16/1/18. Wounded, March, 1918. Raymond, Lieut. A. O. (American Army). Joined, Sept., 1918. Returned to 33rd Field Ambulance, 24/2/1919. Joined, April, 1915. " A " Coy. To England, sick, Aug., 1915. Address—26, Bramham Gardens, London, S.W. Rich, Lieut. E. R. (S. Staff. Regt.). Address—43, Quarrendon Street, Parson's Green, London, S.W. 6. Richardson, 2nd-Lieut. H. B. (16th R. Fusiliers). Joined "C" Coy., 3/2/16. Work Detach, officer, 5/7/16. To M.G.C., 20/8/16. Address—" Glen Heather," Dryburgh Road, Putney. Joined, Sept., 1914. Adjutant. To Depot, Sept., 1914. Roberts, 2nd-Lieut. H. E. (11th York and Lancs.). Joined " B " Coy., 16/3/16. To details, 21/6/16. Robson, 2nd-Lieut. G. W. (S. Staff. Regt.). Joined " B " Coy., 23/11/18. To 1st Army Agricultural School, Dec, 1918. Ronaldson, 2nd-Lieut. H. H. (7th S. Staff. Regt.). Joined, Jan., 1915. " C" Coy. To 10th S. Staff. Regt., June, 1915. Rejoined " C " Coy., 7/2/16. To L.T.M. Battery, 21/7/16. Wounded, Aug., 1916. Address—The Crescent, Braidville Road, West Drayton. Rowntree, 2nd-Lieut. C. W. (Warwick Regt.). Joined, 17/2/16. " C " Coy. Wounded, July, 1917. Rudge, 2nd-Lieut. W. H. (7th S. Staff. Regt.). Joined " C " Coy., 19/4/18. Sanders, 2nd-Lieut. H. A. (S. Staff. Regt.). Joined, 17/9/16. Loaned to 32nd Infantry Brigade, 23/10/16. Savory, Lieut. W. G. T. (11th S. Staff. Regt.). Joined, 1/9/16. To H.Q. Coy., Divisional H.Q., 5/9/16. Loaned to 32nd Infantry Brigade. Scott (Schultz), 2nd-Lieut. A. E. (11th S. Staff. Regt.). Joined " A " Coy., Dec, 1915. To L.T.M. Battery, Jan., 1918. To England, May, 1918. Seckham, Lieut.-Col. D. T., D.S.O. (4th S. Staff. Regt.). Wounded, Messines, June, 1917. Mentioned in despatches Jan., 1917. Jan., 1918. Address—" Lisnegar," Rathcormac, County Cork. Settle, 2nd-Lieut. T. L. (S. Staff. Regt.). Joined, 13/1/17. To R.F.C., 18/5/17. Address—Akanko, Lytham Road, South Blackpool. Shaw, 2nd-Lieut. E. L. (S. Staff. Regt.). Joined " D " Coy., 31/12/16. Shaw, 2nd-Lieut. J. A. (9th Lancs. Fusiliers). Joined, 16/3/16. To 9th Lancs. Fusiliers, 4/5/16. Joined, Nov., 1914. Killed in action, Aug., 1915. Sheppey, 2nd-Lieut. E. T. (S. Staff. Regt.). Joined " B " Coy., 11/9/18. Brigade Salvage officer, Dec, 1918. Address—5 Auckland Road, Sparkbrook, Birmingham. Shone (Schon), 2nd-Lieut. P. N. (S. Staff. Regt.). Joined, 1/9/16. To R.F.C., 18/5/17. Simpson, Lieut. C. V. (3rd S. Staff. Regt.). Joined, 1/9/16. Assistant Adjutant. To England, 30/7/18. Skelsey, 2nd-Lieut. D. (4thS. Staff. Regt.). Joined, 12/10/17. To England, sick, 24/11/17. Joined, Jan., 1915. Signals officer. Wounded, Aug., 1915. Smith, Capt. C. N., M.C. (S. Staff. Regt.). Joined, 1/9/16. Lieut., 15/6/17- Capt., Transport officer, 20/7/17. Demobilised, Feb., 1919. M.C., June, 1917. Smith, 2nd-Lieut. R. G. (S. Staff. Regt.). Joined " A " Coy., 10/7/18. Smyly, Capt. A. F. (S. Staff. Regt.). Joined " B " Coy., 10/7/18. Courts Martial Officer, Sept., 1918. Address—84, St. George's Square, London, S.W. Spence, Capt. J., M.C. (R.A.M.C.). Spencer-Cummings, 2nd-Lieut. J. (S. Staff. Regt.). Joined " C " Coy., 17/12/17. To England, 5/1/18. Address—32, Foxley Road, Brixton, London, S.W. Spicer, 2nd-Lieut. A. C. N.
Joined, Dec, 1914. Wounded, Aug., 1915. Spinney, Lieut. R. E., M.C. (Duke of Wellington's Regt. and Intelligence Corps). Attached during Jan., 1917. Killed in action, Jan., 1917. Joined, 10/11/15.O.C. " D " Coy., 12/11/15. Sick, 27/11/15. To England, 3/1/16. Stanway, 2nd-Lieut. G. R. (5th S. Staff. Regt.). Joined, 20/10/16. Loaned to 32nd Infantry Brigade, 23/10/16. Attached A.P.M., July, 1917. Wounded, Aug., 1917. Address—Stamford Street, Old Trafford, Manchester. Steele, 2nd-Lieut. W. B. (11th S. Staff. Regt.). Joined, 11/10/16. Signals officer. To R.F.C., 20/12/16. Stocking, 2nd-Lieut. W. (7th S. Staff. Regt.). Joined " D " Coy., 16/1/18. Assistant Adjutant, 3/5/18. Strong, Capt. R. (C. of E. Chaplain). Sturt, 2nd-Lieut. E. A. (R. Warwick Regt.). Joined, 17/2/16. To 33rd M.G. Coy., 4/3/16. Summerscale, 2nd-Lieut. H. (R. Warwick Regt.). Joined, 17/2/16. Wounded, 27/11/16. Rejoined, 9/5/17. Wounded, 6/6/17. Summerton, Lieut. H. (S. Staff. Regt.). Joined, Dec, 1914. Scout officer. Killed in action, Cape Helles, July, 1915. Taylor, 2nd-Lieut. R. C. (S. Staff. Regt.). Killed in action, 4/10/17., at Poelcappelle. Taunton, 2nd-Lieut. C. A. P. (S. Staff. Regt.). Joined “C " Coy., Sept., 1915. To England, sick, Dec, 1915. Joined, Nov., 1914. Wounded, Aug., 1915. Subsequently died of wounds. Thompson, 2nd-Lieut. H. V. (3rd S. Staff. Regt.). Joined, 19/12/16. " C " Coy. Lieut., 26/3/18. Wounded, July, 1918. Address—54, Grange Road, West Bromwich. Tinkler, 2nd-Lieut. G. H. (S. Staff. Regt.). Joined " A " Coy., 19/2/17. Tomkins, Capt. W. H. (Chaplain to the Forces). Killed in action, Sept., 1918. Tosdevine, Capt. W. H., M.C. (7th S. Staff. Regt.). 1917. Bar to M.C., 5/11/17. Townsend, Capt. L. G. O. Joined, Nov., 1914. " A " Coy. Killed in action, Aug., 1915. Vaughan, 2nd-Lieut. G. W. (S. Staff. Regt.). Joined " B " Coy., 30/7/17. Killed at Lens, Nov., 1917. Vautier, 2nd-Lieut. (S. Staff. Regt.). Joined, 7/10/16. Transferred 32nd Infantry Brigade, 23/10/16. Walker, Lieut, and Quartermaster E. (S. Staff. Regt.). Appointed Q.M., 26/1/16. from Regt. Q.M.S. Awarded D.C.M., 3/6/16. Watson, 2nd-Lieut. H. (11th Scots Fusiliers). Joined, 16/3/16. To details, 21/6/16. Watson, Lieut. M. M. (S. Staff. Regt.). Joined " B " Coy., 14/7/17. Capt., Dec, 1918. Demobilised, Feb., 1919. Address—62, Marney Road, Clapham Common, London, S.W. Watts, 2nd-Lieut. C. E. (S. Staff. Regt.). Joined " B " Coy., 10/2/18. Wounded, March, 1918. Address—Lloyd's Croft, Tongdeay Avenue, Brighton. Wear, 2nd-Lieut. W. (7th S. Staff. Regt.). Just today, my uncle passed me a copy of this same photo which i have scanned back and front. As you can see, on the back is an inscription in my Grand-Fathers writing, "Taken on Oct 3rd just before the Poelcappelle attack". My Grand-Father is front row, second from the right, 2nd-Lieut Arnold Dixon. At the time he was just 21. Interests:London Regiment Royal Fusiliers, Queen Victoria Rifles. Middle row right hand end (sitting) is Major Charles Albert Muscat, my grand-father's 1st cousin. We celebrated the centenary of his award of an MC yesterday 2/11/16 for his actions at Thiepval in Sept 1916. I have a feeling he must be in that group picture above, difficult to know as when the war he cleared off to South Africa and left wife and family (think he'd had a head wound and was advised to go to warmer climes) so wife was a little bitter and returned his medals and stuff to the regiment apparently. Very little history because his son (same name) and my dads father was killed in Egypt in 1942, my dad was 3! so would be good to be able to find something definitive for my dad. Very interesting Nick. What do you know of his story? A very quick look on ancestry and in the History of the 7th South Staffs (where that listing above came from) brings up the several pages of his pension records and 4 mentions in the history, including a comment about the head wound at Gallipoli. I think the "Joined 20/5/16" is a typo because he first joined the Staffs in 1885 aged 16 , retired in 1906 and signed on again in August 1914. His medal card says he transferred to the 52nd Notts and Derby Regt. Happy to email you any info you haven't found for yourself! He'd left the 7th South Staffs by end of 1916 so wouldn't be in the above photo of 3rd October 1917,. Pagius, have sent you a mail, fascinating stuff! Not sure if this is relevant, but see attachment concerning announcement in London Gazette, Oct 1920, under S Staffs, regarding Capt Cowap? And another in 1918 relating to S Staffs under "memoranda". I found myself on this page after restarting looking for who the attached South Staffs Lieutenant Colonel might be. The picture is from the book "Lost Tommies" and intrigued me because of how unusual he looks, in that he has darker skin and a Mediterranean look. Given the attitudes of the era he must have had a rough time of it from some of his Army comrades, but he looks supremely confident and must have been able to overcome such prejudice and make it to the rank of Lieutenant Colonel. 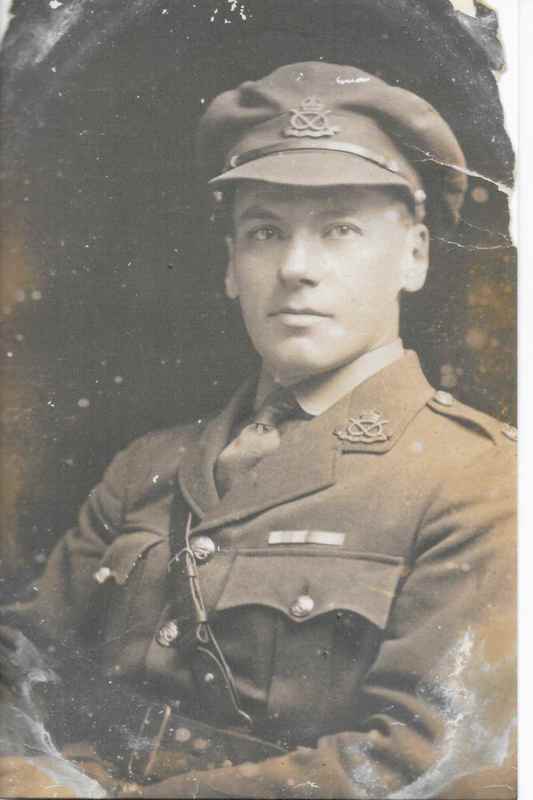 Identifiers are his South Staffs cap badge, 2 wound stripes, 3 overseas service chevrons (which means this is probably late in the War), and a medal ribbon (possibly MC?). I had a look in the Army Lists for the South Staffs, and didn't turn up anything definitive - but I did spot a Charles A Muscat who had the MC and had served in the Royal Malta Regiment of Militia - the highest rank I saw for him was Major but I thought that maybe he might have been given a local rank of Lieutenant Colonel at some point. Whatever, coming to this page and seeing the picture posted by Pagius has shown me I was barking up the wrong tree and so am looking for another tree to bark up. Anyone got any ideas? I bet there's a fascinating story behind this man. I do have a couple more images. I believe his medals and sword of honour are in the Wolverhampton Museum, but I am not 100% sure of this. I missed out his full name, as i am without vision. Photo taken 100 years ago today as the 7th South Staffs prepare to attack on 4th October. They were in the front line trenches west of Poelcappelle , so I'm wondering where they managed to find some trees and grass in the midst of the desolated landscape to pose the photo! Thinking of cousin Major Charles Muscat MC , seated RH end middle row, today especially. I had the same thought when I posted! I guess the latest this would have been taken was at the end of September. 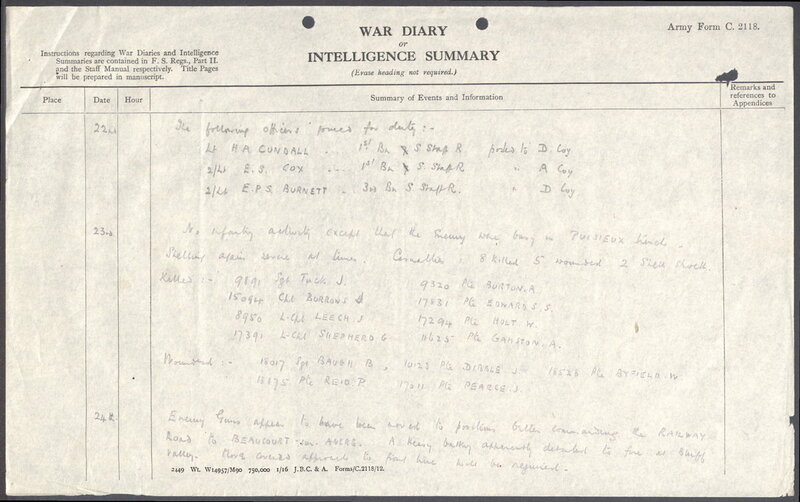 I see in the diary they were inspected by Sir Ivor Maxse on the 28th when resting/training at Houtquerke, so maybe? I'm sure your grandfather would have written it correctly "Photo taken on Oct 3rd"? Although the normal image is of a totally desolate flat field of mud with bare sticks of tree there were probably one or two surviving enclaves where they could find a reasonable backdrop of greenery. Question is where! I have only recently seen this particular blog, having been sent the link by a descendant of one of the officers in the photograph. Since then a number of things have come together, all detailed below. Andy Johnson mentioned that one of the officers - the Adjutant - might be Captain J A Baillon. This was Joseph Aloysius, or Jo, Baillon and I am in touch with his grandson. Jo Baillon survived the war and finished WW2 as a major general. He died in 1951 at the age of 56. His son, Peter Baillon, also went in to the South Staffords but transferred to the Parachute Regiment in the late 1950s, finishing his service as a brigadier. He died last year at the age of 92. I only have a photograph of Jo Baillon when a general but pretty certain he is the officer on Lt Col Harry Carter's right (ie, our left). I am checking with the grandson, Richard. Second from the left, as we look at it, is Captain Frank James Dermot Lindner, known as Jim. Jim's son, Gerald, is alive and well and also followed his father in to the South Staffords. I will be seeing Gerald in a couple of weeks and might be able to find out more. 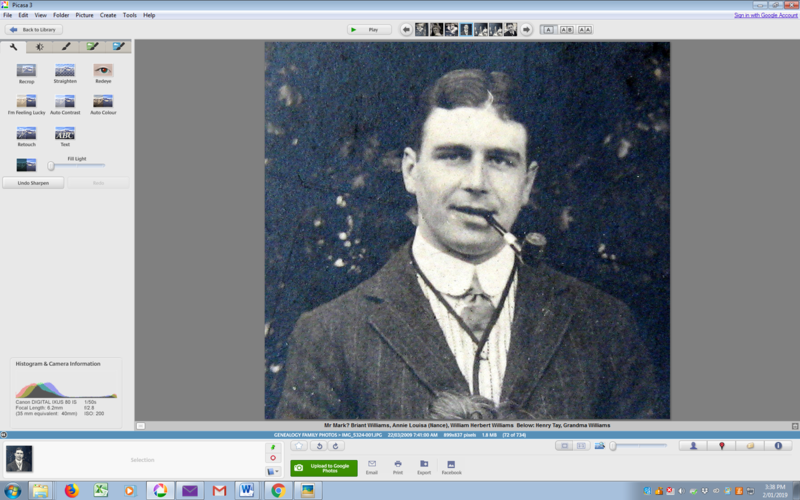 Another officer in the photograph might be Bertram Florey. I am checking this out with his great grandson but he does not think Captain Florey is here. However, there is an earlier photograph of the officers of the Battalion, taken in either late 1914 or early 1915 before they left England. The CO here is Lt Col A H Daukes, killed, as were many of his officers, at Suvla Bay in August 1915. Could I ask Andy or someone to send me a high resolution image of the 1917 group and I will give a copy to Gerald Lindner. Can't see Charles Muscat in this one, He joined the 7th South Staffs in September 1915 in Gallipoli. does anyone have any information on where rhe 7th Battallion would have been in November 1916? My great-grandfather L Cpl George Shepherd was killed on 23/11/16 and I would appreciate any further details. Message me if you need any more info or leads. 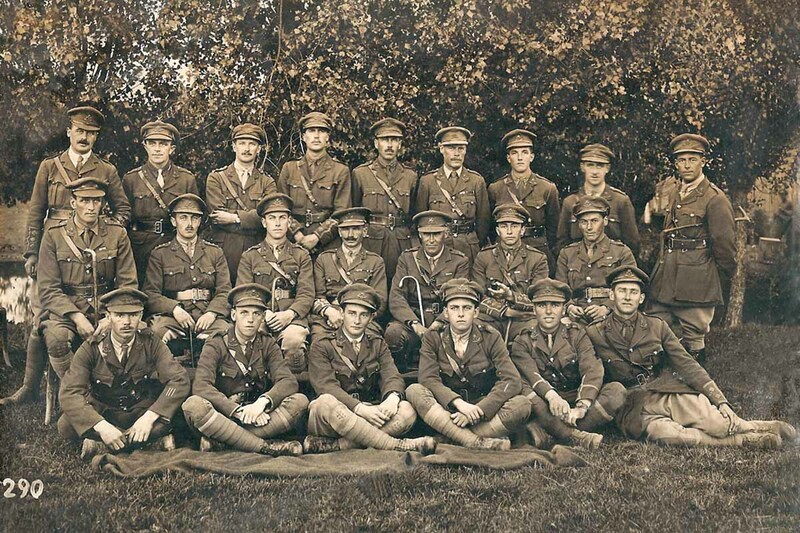 Interested to confirm whether my great-uncle William Briant Cooper WILLIAMS (born 1883), Lieutenant and later Captain in 7th South Staffordshire Regiment, was in this photograph as he looked quite similar to the officer standing on far left, top row. The London Gazette contains several records for W.B.C. 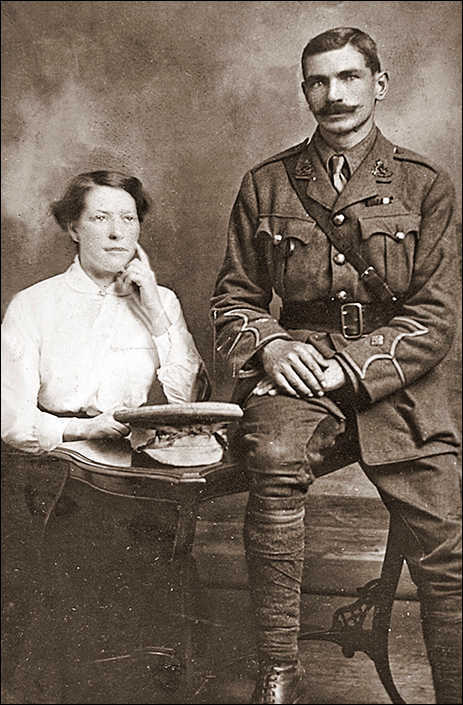 Williams - earlier in the 1st Volunteer Battalion as Second Lieutenant (1903), 5th Battalion as 2nd Lieutenant (1/4/1908), temporary rank Lieutenant in 5th Battalion South Staffs on 18/9/1914. Also temporary rank Captain 1918. Could he have been transferred to 7th Battalion as he was initially at Gallipoli ? "The 7th (Service) Battalion landed at Suvla Bay as part of the part of 33rd Brigade in the 11th (Northern) Division in August 1915. The 7th (Service) Battalion moved off to the south to dig a system of flanking trenches while other units forward from B beach, Suvla Bay. It was evacuated from Gallipoli in December 1915 and moved to Egypt before landing in France in July 1916 for service on the Western Front. " By 1918 electoral register recorded him as located at 73 Corps, Newhall St, Birmingham and "Lieutenant 7th South Staffs"